Undoubtedly, Mozilla Firefox sometimes uses more memory (RAM) than it should. But you shouldn’t worry too much because using popular web browsers like Google Chrome, Mozilla Firefox or even any web browser for a long time will lead to the low speed of the browser and will start eating up a lot of resources. Firefox using too much memory and Mozilla Firefox high CPU usage are some of the most common issues experienced by a lot of Mozilla Firefox web browser users. And one of the best ways to reduce Firefox high memory usage or fix Firefox using too much memory issue is by reinstalling the browser as it will clear all the files completely. However, there are plenty of hacks to reduce Firefox memory usage without reinstalling available too which you can follow in order to easily fix Firefox memory leak issue. You will find many different methods on the internet which will help you in troubleshooting Firefox memory leak issue and if you want to find out what these methods are then you can have a look below where we have mentioned how to reduce memory usage in Mozilla Firefox web browser and speed up Firefox browsing. Important note: Before following the below-explained hacks, we recommend you to backup your existing Mozilla Firefox profile and experiment in another profile. The backup will help you in future to easily restore your current settings and preferences. The Huge amount of memory is used in Mozilla Firefox by default. What you can do is assign specific size memory cache for Mozilla Firefox so that it is not interfering with system memory and is not leading to Firefox high CPU usage issue. First of all, type about:config in the address bar of your Firefox browser and press Enter. Next, you have to add a value in the “browser.cache.memory.enable” preference. Simply, double click on browser.cache.memory.enable and set its value as True. Next, right-click on any value and select New > Integer option then enter browser.cache.memory.capacity in the “Enter the preference name” box. Finally, click on OK button. Now, if you are having 4 GB RAM on your system then you can enter 256 MB and if you are having 8 GB RAM you can enter 512 MB in the “Enter integer value” box and then click on OK button. 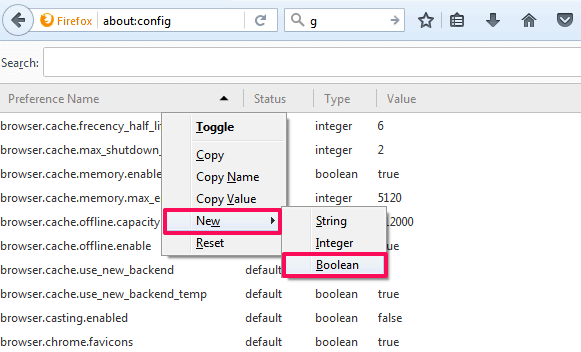 Open Firefox browser and type about:config in the address bar. Next, right-click anywhere in the browser and then select New > Boolean option. Now, type confirm.trim_on_minimize in the “Enter the preference name” box. Finally, click on OK button. 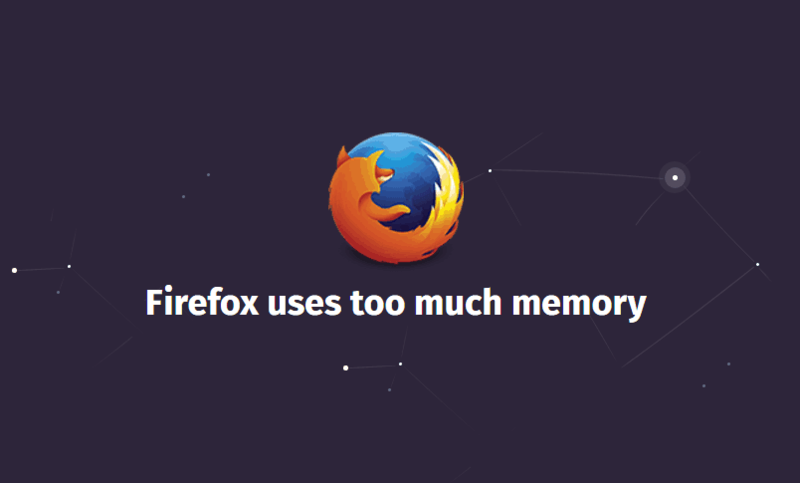 Releasing memory after minimizing Firefox is really a helpful way of reducing memory usage in Mozilla Firefox browser. So, this action will result in the reduction of memory when you will minimize Firefox browser on your computer. Total 50 websites are saved in the memory of Mozilla Firefox by default. It means that if you have accessed 50 webpages on Mozilla Firefox, you will be able to see all these web pages in the cache memory or history of your browser. Reducing Firefox browser session history is also an amazing Firefox high memory usage fix. At first, open Mozilla Firefox web browser and type about:config in the address bar. Now, you have to find browser.sessionhistory.max_entries preference. Once you have located this field, right click on it and then Modify it to any lower value you want to. Finally, click on OK button. As you can see, here we have decreased the browser session history value from 50 websites to only 10 websites. First of all, open Mozilla Firefox browser and then go to Tools and then select Options tab. Next, click on Privacy option and then select Use custom settings for history option from the Firefox will drop-down menu. Finally, uncheck the option which says “Remember my browsing and download history” option. From now onwards whatever you download won’t be saved in the download history of your web browser. 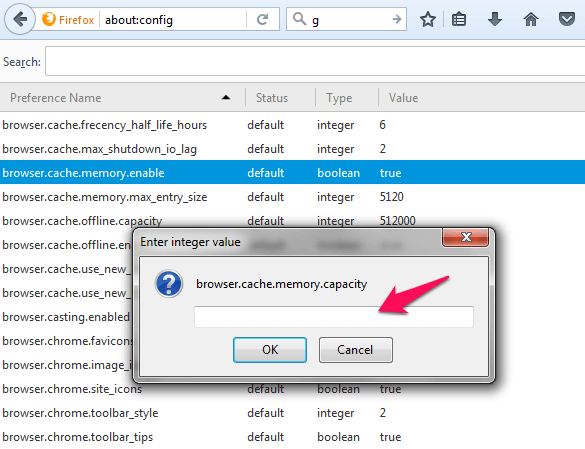 This method will help you in solving Firefox taking too much memory issue. HTML pages are rendered in Firefox after a fixed interval of time. You can set that interval to 0 as it will help you in loading the pages faster as soon as you enter URL in the address bar. In order to speed up page display time, open Firefox browser and then type about:config in the address bar. Once opened, you have to make new integer preference by doing a right click. Enter nglayout.initialpaint.delay in preference name and mention value 0 there. This is the last Mozilla Firefox using too much memory fix which makes to our list. You should use bookmarklet instead of add-ons on Mozilla Firefox browser as add-ons lead to high memory usage on Firefox web browser. As Firefox gets updated from time to time, add-ons don’t which make bookmarklet a better option. It is easy to use bookmarklet as all you have to do is drag and drop the bookmarklet in the bookmarks toolbar of your Firefox browser. If you don’t want to reinstall Mozilla Firefox web browser but are wondering how to fix Firefox using too much memory and CPU resources issue then you can follow the methods to troubleshoot Firefox high memory usage which we have mentioned above. Do you know any better solution to fix Firefox using too much memory or get rid of Firefox memory leak? If yes, let us know via comments.